Hooligan racing is ? as the name suggests ? a hell of a lot of fun and when an Aussie caught a glimpse of the action he wanted in, bad. The machines are road-based; a mix of street tracker and dirt bike that rip it up on the flat track. For Australian metal fabricator extraordinaire Jamie Portelli of Fabtech Creations, a trip to the USA had him hooked and he started planning the build before he’d even boarded the QANTAS flight home. 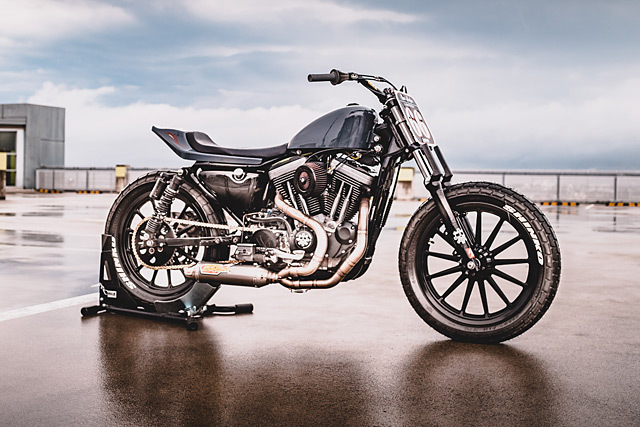 The end result is this rampaging 1997 Harley Davidson 1200 Sportster ‘Super Hooligan’ that’s ready to rip it up and then hit the highway after victory. ?I first saw the ?Super Hooligan? bike race when it was introduced at the X Games in Minneapolis and instantly loved the flat track concept. I returned to X Games in 2018 to support friends who ride in the Super Hooligan series and was impressed with how far the concept and standard of riders and bikes had developed,? explains Jamie. Instantly he knew it was something he wanted to be a part of and started to make calls back home to Australia about suitable donor bikes that were for sale and also picked up a bunch of parts for the project before leaving stateside. Arriving home, he took the 10 hour journey to Brisbane where he found the ’97 Sporty and it was just the right bike to get things going. As to whether he was up to the task of creating a Super Hooligan machine, it was never in question, Mr Portelli is no ordinary talent. He doesn’t just build bikes, but is also involved in the custom car scene, a range of high-end metal fab projects and was one of the men responsible for making Robbie Maddison’s Pipe Dream of riding a bike on the ocean possible. ?He was one of the men responsible for making Robbie Maddison’s Pipe Dream of riding a bike on the ocean possible.? So it comes as no surprise that the moment the bike was in his workshop, he had it stripped down in a matter of hours. But before he started, he’d done his homework, ?I researched the history, the builds and riding techniques and now must say have become completely hooked on the concept ? I wanted to design, build and race. I knew I had the skills with the design and build but would now need to step outside of my comfort zone to learn the track side of things,? Jamie tells us. The first step was to get the basic look right and the rear subframe was quickly removed with the grinder fired into life. Atop the shortened section is a Saddlemen tracker tail and seat, while a peanut tank makes for the perfect match. But while weight reduction helps, taming the track largely rests on the suspensions shoulders with a heavy bike and Jamie has it dialled in. The rear end features a set of 14? Racing Bros ?Bazooka? shocks, a well proven product for the Harley.